He was born in Istanbul in February 1609. His real name was Mustafa. He is known as Haci Halife in the East and as Haci Kalfa in the West. His father Abdullah was educated at Enderun and left the palace on duty as a squire. 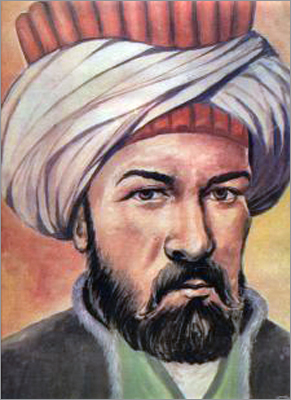 Katip Celebi who received special education until the age of 14, began to pass through Anatolian Accountancy School in 1623. He attended the Eastern Campaigns as a clerk during Murad IV Period (1624-1640). He returned to Istanbul in 1635 and completely devoted himself to reading and writing. He was promoted as the second caliphate in the office via Seyhulislam (the chief religious official in the Ottoman Empire) Abdurrahim Efendi because of his work named Takvimu't-Tevarih in 1648. Katip Celebi, who continued his efforts to learn and teach afterwards, began to produce works one after another. He wrote over twenty books as translation works and literary compositions. The most important works are in the fields of history, geography and bibliography. His first work in the field of history is Fezleke (history of the world) written in Arabic and completed in 1642. After the meaning, subject and benefits of history are explained in the book with four chapters, a bibliography of primary works in this field is stated and then states founded since the creation of the world until 1639 and significant events that had taken place are briefly listed in accordance with Classical Islamic History. The Turkish Fezleke as the extension of the Arabic Fezleke is an Ottoman History describing occasions between 1591 and 1654. And Takvimu't-Tevarih is a chronology of historical events that took place since Adam Prophet until 1648. In Tuhfetu'l-Kibar fi Esfari'l-Bihar which is among his most well-known works, the operation of dockyard and navy organizations of the Ottoman Fleet are explained besides the Ottoman maritime history since its foundation since 1656 and gives place to the life histories of kaptan-i deryas (Commanders- in-chief of the Navy). In the end, advices in order to eliminate the failures in sea wars in recent times are listed. The work named as Cihannuma is one of the most significant works on geography and ushered a new era in the Ottoman Geography. The most well-known work of Katip Celebi in the West is Kesfu'z-Zunun an Esamu'l-Kutubi ve'l-Funun. In this work containing a bibliographical dictionary in the Arab language, 14.500 book and booklet names and their authors are stated. The work arranged according to scientific classification in an alphabetical order was completed in twenty years. In his last work, Mizanu'l-Hakk fi Ihtiyari'l-Ahakk, he explains his thoughts about various subjects that were debated by religious wises of the period. He advises tolerating the opposite point of views. A major Turkish bibliographer, Katip Celebi died in Istanbul in the 6th of October in 1657.